Washington sophomore Collier Brown (left) squares off against Miami Trace senior B.J. Anders in a 182-pound match at the Sectional tournament Saturday, Feb. 24, 2018 at Washington High School. The Washington Blue Lions have five District qualifiers and one alternate for this weekend’s tournament at Wilmington High School. (l-r); Colton McNichols, Chris Conger, Courtney Walker (alternate), Zane Nelson, Collier Brown and Will Baughn. The Miami Trace Panthers have eight District qualifiers for the tournament in Wilmington to be held Friday and Saturday. (l-r); Jacob Tinkler, Jaymon Flaugher, Storm Duffy, Dylan Arnold, B.J. Anders, Mcale Callahan, Graham Carson and James Munro. Not pictured is District alternate Dalton Bartley. Miami Trace senior Jacob Tinkler (at left) wrestles Sean Netherton of Westfall in a 170-pound match at the Sectional tournament Saturday, Feb. 24, 2018 held at Washington High School. Washington Blue Lion sophomore Will Baughn wrestles at 138 pounds during the Division II Sectional tournament at Washington High School Saturday, Feb. 24, 2018. 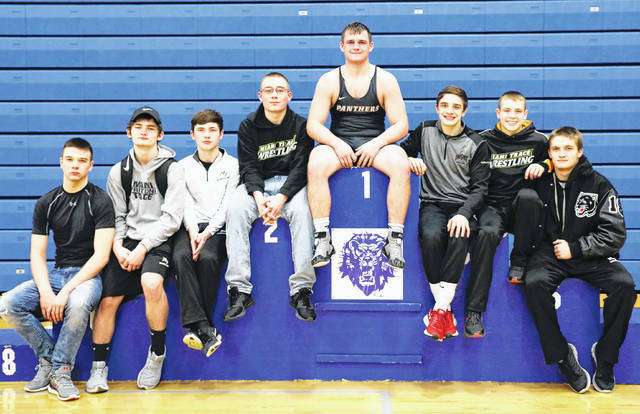 A total of 13 wrestlers from Fayette County have qualified to the District tournament coming up Friday and Saturday at Wilmington High School. Eight wrestlers from Miami Trace High School and five from Washington High School will be competing beginning Friday at 3 p.m.
Each school also has one District alternate. From Miami Trace, senior B.J. Anders is a Sectional champion at 182 pounds. 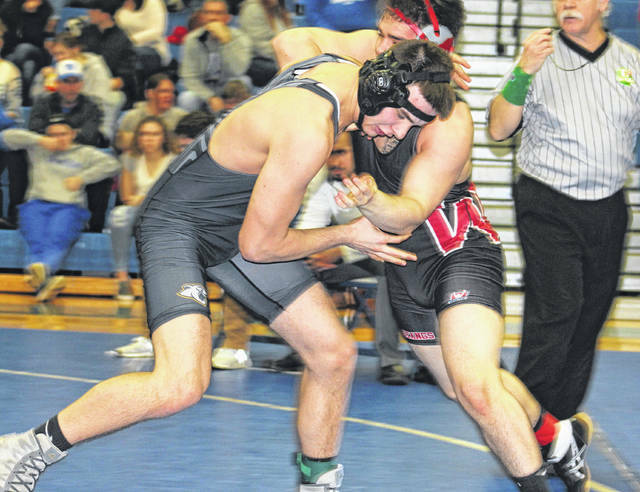 From Washington, seniors Zane Nelson (152) and Chris Conger (170) won Sectional titles. From Miami Trace, freshman Graham Carson (113), freshman Mcale Callahan (126), junior James Munro (160) and senior Jacob Tinkler (170) placed third at the Sectional. Sophomore Will Baughn of Washington was third at 138 pounds, sophomore Collier Brown was fourth at 182 pounds and junior Colton McNichols was fourth at 285 pounds. From Miami Trace, senior Jaymon Flaugher was fourth at 145 pounds, sophomore Storm Duffy was fourth at 120 pounds and junior Dylan Arnold was fourth at 152 pounds. 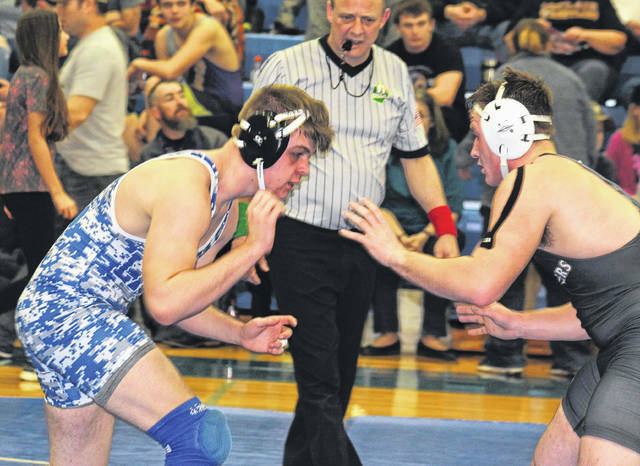 Senior Courtney Walker of Washington (106) and senior Dalton Bartley of Miami Trace (220) both placed fifth in their weight divisions to become District alternates in the event of illness or failure to make weight of one of the other contestants in their weight class. Nelson (38-7) will wrestle Bellefontaine sophomore Noah Yoesting (20-17) in the first round at the District. This will be Nelson’s third trip to the District tournament. “Chris Conger wrestled a good tournament,” Reid said. “He wrestled (Sean Netherton) a returning State qualifier from Westfall (in the finals) and won that match, 7-0. Chris looked really good all tournament long. I was really impressed with how dominating he looked in the finals. “We worked on some things as far as from neutral and talked about being light on his feet and he did exactly that the entire tournament,” Reid said. Conger (36-8) will face Meadowdale senior Dawon Smith (17-4) in the first round Friday. This is Conger’s third time qualifying to the District meet. Both Conger and Nelson have 147 career victories. This will be Baughn’s first trip to compete at the District. Baughn (24-13) will meet senior Ben Sherrill (32-2) of Bellbrook in the opening round of the District tournament. 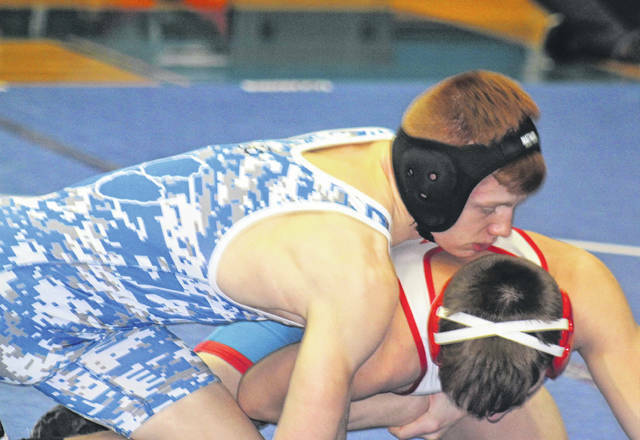 “Collier is another wrestler who has been up and down this season,” Reid said. “He started the tournament off great as a No. 6 seed. He upset the No. 3 seed and then wrestled a pretty good semifinal match. “In the consolation round, he wrestled (Kyler) Trefz of McClain who had beaten him three times this season and he beat Trefz in overtime,” Reid said. “It was a huge win. He ended up losing his third and fourth place match to a kid that he had beaten already in the tournament. Collier is a first-time District qualifier. McNichols (12-8) will square off against Eaton junior Seth Bowman (26-10) in the opening round of the heavyweight division. Washington placed sixth at the Sectional with 109.5 team points, one-half point ahead of McClain. “Fifth place through eighth place was really close,” Reid said. “We were only filling 12 weight classes. We had at least two kids wrestling out of weight. Myself and the coaching staff, we were really pleased with the way the kids wrestled. “I told him, ‘hard work always wins out,” Fondale said. Anders (36-11) will face Cincinnati McNicholas sophomore Ryan Gear (13-7) in the opening around of the District at 182 pounds. Carson (32-13) will meet sophomore Jayden Sturgell of Urbana (14-5) in the opening round of the District tournament. Callahan (29-4) faces sophomore A.J. Lewandowski (30-14) of Oakwood in his first District match. Munro’s first opponent at the District tournament will be senior Will Steuerwald (26-9) of Indian Hill. Up first for Tinkler (23-13) at the Districts will be sophomore Gage Johnson (32-8) of Franklin. Duffy (22-21) will face sophomore Tyler Harkins (28-11) of Norwood in the first round of the District meet. Flaugher (21-19) will take on senior Mitch Moore (35-5) of Graham Local in the opening round at 145 pounds. Arnold (19-14) faces senior Carston King (37-9) of Oakwood in his first match at the District tournament. “These guys all have their own individual goals,” Fondale said. “That ultimate goal, for some of them, is just to make it to the State tournament. For others, it’s to place at State. We don’t set goals to go out and not compete and not try to make it to the next level. “I can’t say that any of my guys realistically don’t have a goal of making it to the State tournament,” Fondale said. Miami Trace placed fourth at the Sectional with 146 team points. Logan Elm won the Sectional with 192 points, followed by Circleville with 162 and Westfall with 148 points. Fairfield Union was fifth (117.5), Washington was sixth, followed by McClain (109), Hillsboro (101), Zane Trace (86) and Unioto (20).